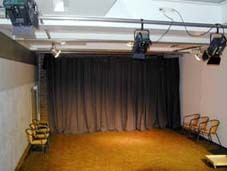 The performance space offers a lot of varities of utilization. First of all, his dimensions are 5,90 metres by 11 at a height of 2.9 meters. It is also possible to get daylight by skylight or to make the room partially oder completely dark by electric roller blinds. So working with projektors in every kind is no problem. 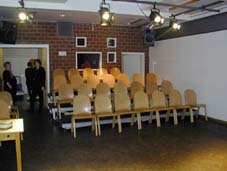 The room can be used for seminars and conferences with a seating from 40 to 80 chairs and tables. On the scene there are variable stage elements to set up many different forms of stages and stands (as large as 12 square metres) for concerts, readings, cabaret or small theatre performances. The technical and media equipment can be controlled from the central control room near you or from the performance space as itself. Grand piano, Microphone set, videobeamer with a screen of 2 metres by 3, illumination for theatre and stage, curtain. The ton set can be used as well as for live music and disco by 16 inchannels and 6 outchannels (quadrophonic in the 4 corners of the room and 2 monitor ways). Supplementary you can need a complete sonor drums (without cymbals) for guest performances. There is a possibility to record with a DAT-recorder or direct to computer from the control desk or by high-quality microphones in the room.